The 2018-19 edition is all new! Our print schedule now includes July 1, 2018 pastoral assignments – effectively changing from a calendar year to a fiscal year. 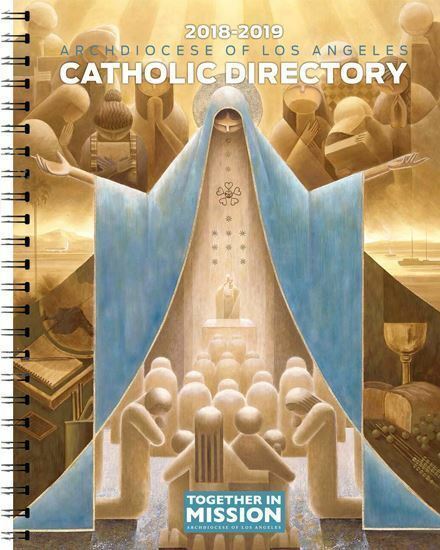 Only the distribution date has changed (formerly every January, now in August); it’s still the same award-winning Directory that is spiral bound with an updated parish section, including the new priests’ and deacons’ photos. This year we highlight the 25th anniversary of Together in Mission (with commemorative cover art by Lalo Garcia). Established in 1947, The Tidings Directory for the Archdiocese of Los Angeles (comprising the three counties of Los Angeles, Ventura and Santa Barbara, divided into five pastoral regions), lists all address and telephone information of archdiocesan offices, parishes, schools and seminaries, as well as services/outreach programs within the Archdiocese. The Los Angeles Catholic Directory editions of 2011, 2013, 2014, 2016 have been awarded by the Catholic Press Association in the Diocesan Directory category.